Your teeth are not indestructible. Though their enamel is as tough as steel, your teeth can still suffer from decay and other dental problems that compromise their strength and beauty. At A Plus Dental, our restorative dentistry devices are made of durable materials for top performance and aesthetic quality. Inlays and onlays are restorative dentistry devices that solve a number of dental problems. Read on to learn more. Inlays and onlays function like dental fillings but are recommended for different decay stages. 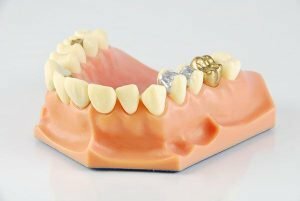 This is the reason they are often confused with dental fillings and dental crowns. Inlays and onlays are used when the damage is too severe to be treated by dental filling but not so severe as to require a dental crown. They are conservative dental treatments as they involve minimal removal of natural tooth. Inlays and onlays are also proven to last longer and be better for chewing than dental fillings. An inlay is placed within the cusps of the damaged tooth. It is the smaller treatment of the two. An onlay, on the other hand, sits on the top of the affected tooth and helps rebuild the shape of the damaged tooth. Ideal candidates can only be determined by a dentist. Getting inlays/onlays takes two dental appointments. On the first appointment, the damaged tooth is inspected. The area is cleaned and all the decayed parts are removed in preparation for the restorative device. An impression of the tooth is taken to get your accurate measurements. This will be sent to the laboratory where your dental restorations will be created. A temporary filling is placed on the damaged tooth while your dental restoration is fabricated. On your second appointment, the temporary filling is removed and the inlay/onlay is placed in its position. Once the material has been properly placed, your dentist will check and evaluate its fit. If your teeth trouble you, see your A Plus Dental dentist right away. We have comprehensive treatments to address your dental problem and stop it from ruining your smile.